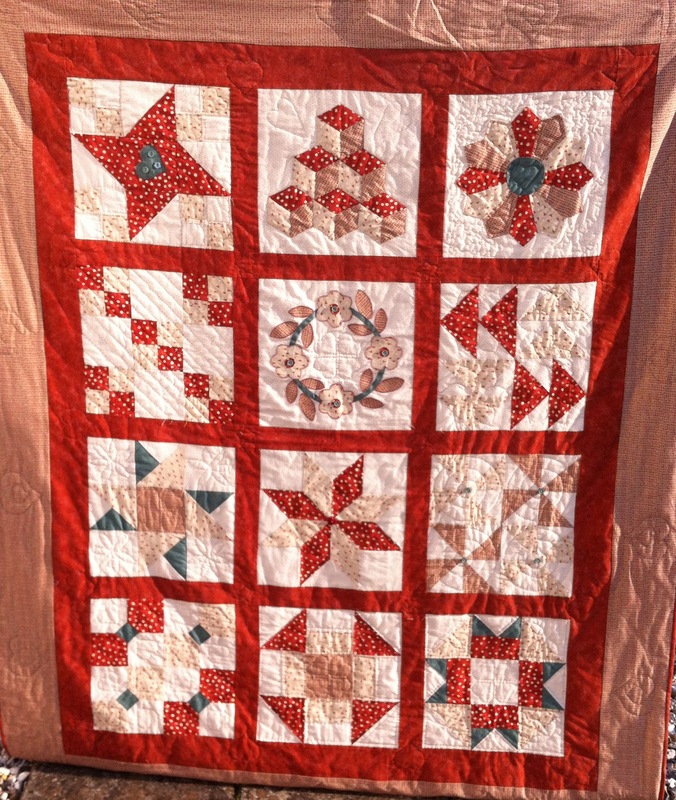 Edith has been quilting for a long time, but after her husband died, after a long illness, Edith decided to go along to Sue Warrens 'Beginners Machine Patchwork ' course, back in January this year. Edith said, she really hadn't had time to be as precise in her patchwork as she would have liked and felt a refresher course with Sue, would help her get back in to things. As you can see, it's really worked and Edith has made this lovely blue and pink quilt. Edith really enjoyed the course and is now busy making all kinds of things for family and friends. 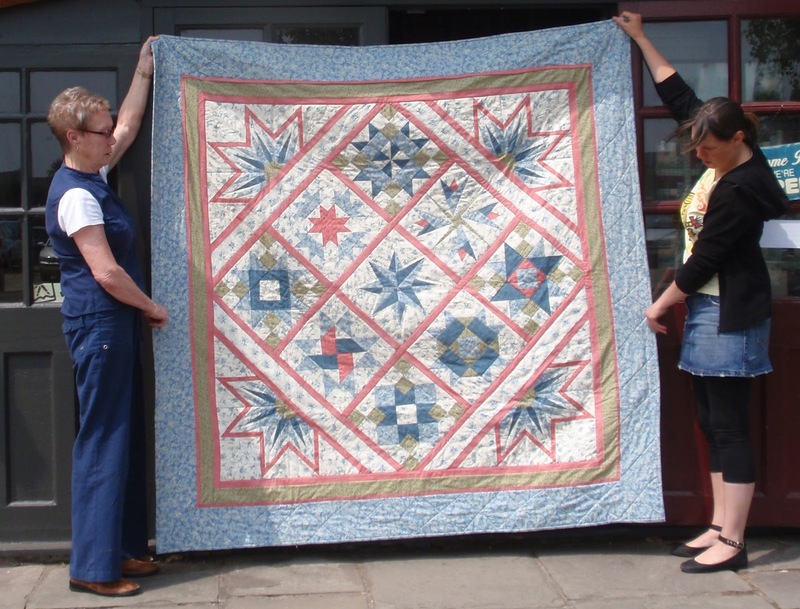 The next quilt was made by Hilary Jones from Usk. 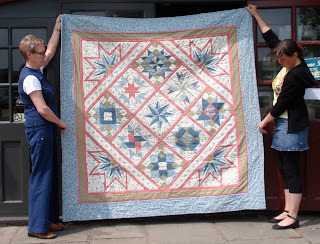 Hilary started patchwork last September, at Sue Warrens 'Beginners Hand Patchwork' course. Hilary is over the moon with the results of her efforts and is now busy finishing off her second quilt that she started in January at Sue's 'Beginners Machine Patchwork ' course. Hilary is now 'one of the gang' at Busy Bees." I've had so much fun at the courses and met some wonderful new friends" said Hilary. If you would like to come along to one of Sue's beginner courses, the new workshop programme is out on Saturday 21st July. We will have samples of all the workshop and courses on offer in Duffryn community centre. You can also met a few of the tutors and have a chat with them about their classes. The Tuesday Girls Group will be selling tea, coffee and cakes in the hall in aid of Ty Hafan www.tyhafan.org . When you have had a good look around and enjoyed your refreshments, you can pop over to the shop and sign up for the classes you would like to join. 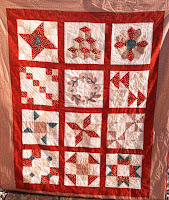 This time next year, I maybe putting a photo of your quilt up on Busy Bees blog!